Do you want to be Best-in-Class in Supply Chain and Logistics? Remember, companies in those upper echelons provide quality service at half the cost of their peers. Do you want to stop hemorrhaging money on Supply Chain and Logistics costs and start exploiting major opportunities for improvement? Do you want to stop hemorrhaging money on Supply Chain and Logistics costs and start exploiting major opportunities for improvement? Of course you do! Unfortunately, without knowing how high the Best-in-Class bar is, you’re pretty much grasping at straws. Understanding how your business stacks up against your competition is therefore essential. Benchmarking your Logistics and Supply Chain will greatly improve customer service while reducing costs. All your Benchmarking and Supply Chain Improvement needs are right here. Through our Benchmarking Division, Benchmarking Success, we are able to provide a full range of Benchmarking and performance improvement services. Let our range of proven Benchmarking and Business Improvement techniques drive improved performance and bottom line impact in your business! Do you really know your Business Performance and Potential? So Benchmark It! Do you know how your end to end Supply Chain performs against major competitors? Do you know how key ‘components’ of your Supply Chain perform against competitors? Do you know what Supply Chain Key Performance Indicators (KPIs) you should be using to drive improved performance? For your Supply Chain Key Performance Indicators (KPIs), do you know what the realistic and stretch targets should be? Have you ever spent quality time with senior Executives with similar Supply Chain challenges, learning how they have improved their businesses? If you answer No to any of these questions, you are missing out on real business improvement opportunities. Our consultants will guide your staff on the compilation of your benchmarking performance data that will then be compared against companies with similar Supply Chain characteristics. Whilst you will not have access to other companies data, you will know which companies are within the group you are being Benchmarked against. A summary of the key business opportunity areas. Cost and Service trade off comparisons with others in your industry. This clearly highlights cost and service performance issues. Cost and Service ‘best practice’ comparisons by each major Supply Chain function. Your Supply Chain KPIs compared to the Best, Average and Worst performers in your industry. 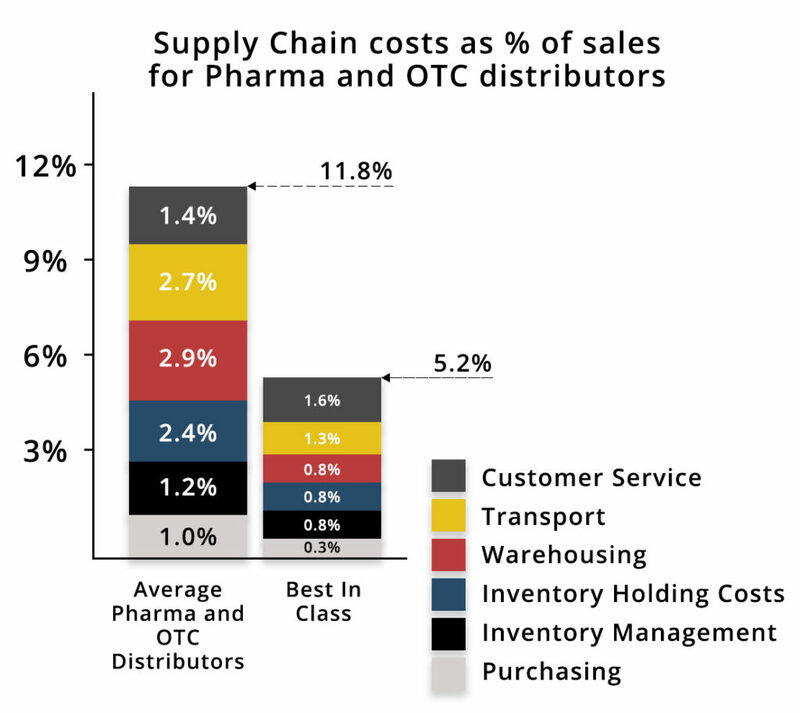 Supply Chain costs as a % of sales for key functional areas. Supply Chain service performance compared to ‘best practice’. Your Delivery In Full On Time (DIFOT) performance, quantifying the specific areas for improvement. A review of your Sales & Operations Planning process and its impact on performance. All of this will be provided in an environment to ensure your key staff understand the benchmarking report fully and appreciate where and how the business performance can be improved. Our specialist team can work with you to develop specific Key Performance Indicators (KPIs) to match the needs of your business. Develop Key Performance Indicators (KPIs) that are aligned with your Company Corporate KPIs, and which support your Company’s commercial Supply Chain objectives, and help deliver business performance & improvement. Why not join one of our Supply Chain Peer Groups with up to 10 non competing companies to participate in the exchange of best practice benchmarking information and ideas? Regular face to face meetings with the Group. 4 times per year. The exchange of best practice information and ideas. A complimentary Supply Chain Audit Report on first joining. Facilitated discussions as well as external ‘expert’ speakers. For large companies, we also provide internal Peer Groups to encourage business improvement across Divisions and Countries. Enquire about our Peer Groups now, directly with those that manage them. Benchmarking Success now also provide an On Line Benchmarking service to help you drive business improvement with appropriate Benchmarks. This subscription based Supply Chain and Logistics Service is designed to provide you with an annual strategic snapshot of your supply chain performance. Supply chains have the power to support and help drive company growth. Understanding the elements required to ensure your supply chain fulfils that role is enhanced through external benchmark comparisons. This service is part of a range of Benchmarking Success services focused on assisting organisations on the supply chain improvement path towards world class. After subscribing you will receive fact-based data comparing your supply chain against performance data from our database, with KPI data that is industry and supply chain specific. Supply chain and logistics costs. Cash to cash cycle time. Delivery in full and on time (DIFOT) as actually delivered to your customers. Probability of a perfect order in your Supply Chain. This highlights key improvement opportunities. Within this Supply Chain Assessment you will receive information that strategically compares your supply chain and logistics performance with a like industry and supply chain type. You will be able to assess the gap between your current performance and world class supply chain performers. CEO’s and senior executives love this output as it is clear where the organisation needs to go. All you need to do is pick the KPIs you want, the industry you want and see how others perform! Are you up there with the best? Visit the Benchmarking Success website to learn more about our Online KPIs. Benchmarking Success is a recognised industry Leader in the support of business improvement through Benchmarking and is an operating division of Logistics Bureau a leading management consulting group spanning the Asia Pacific region. Benchmarking Success has provided Benchmarking services since 1993, and now has over 800 companies on its Supply Chain Benchmarking database. These companies represent a broad range of industries and geographic locations. We doubt there is a major industry that we cannot provide Benchmarks for! Give us a try. 1. What if you don’t have any companies in my industry sector in your database? That is highly unlikely. But in the event it is true, we can still create very valuable Benchmarks using companies in the data base that have similar Supply Chain characteristics. Furthermore, the Benchmarking of specific functions within the Supply Chain, is also valuable against other industries, as this can indicate the size of the prize if industry paradigms are challenged. 2. Will my company data be secure? Absolutely! The Benchmarking database is only accessible by senior members of the Benchmarking team (not even our Managing Director has access) and has multiple levels of security. There is no chance that competitors can access your data. And if your data is part of a comparative data set for another company, only the best, average and worst in that group are shown anonymously. 3. How can I be assured that the Benchmarking data is up to date? Our database is constantly being added to and updated from a broad range of sources. Only up to date and relevant data is used. 4. My business is unique, how can you Benchmark it? Many businesses think they are unique, but usually they are not. In the rare cases that they are quite unique, valuable Benchmarks can still be gained from a range of alternative industries, that may have specific Supply Chain functions that are similar. 5. Are there discounts available if we Benchmark multiple Locations or Divisions of our Business? Yes indeed there are. If undertaken at the same time considerable effort can be reduced and this will be reflected in the cost. 6. If you do not operate in our Country, can you provide Benchmarking services remotely? Yes we can. The full range of Benchmarking services has been recently enhanced so that we can provide a full service remotely. Even guiding your staff through the data collection on line. Visit the Benchmarking Success website to learn more about our On Line KPIs. Logistics Bureau has been part of our supply chain improvement programme for some time. Their understanding of supply chain processes and practice is excellent. The SCAR® process has been an integral part of our development and the understanding of how good we could be. Joining a Peer Group has broadened our knowledge and started the next phase of our improvement programme.